Wow! Another month. Gone. Seriously, is it just me or is this year whizzing past mega fast or what? I'm sad to report that I've been an utter bore this month and have done nothing but concentrate on project bag production for upcoming events. You know how the saying goes: all work and no play...makes Miso a dull crafter. Or something along those lines. You know what I mean! Unfortunately having a dull month means a short obsessions list. But whatevs. 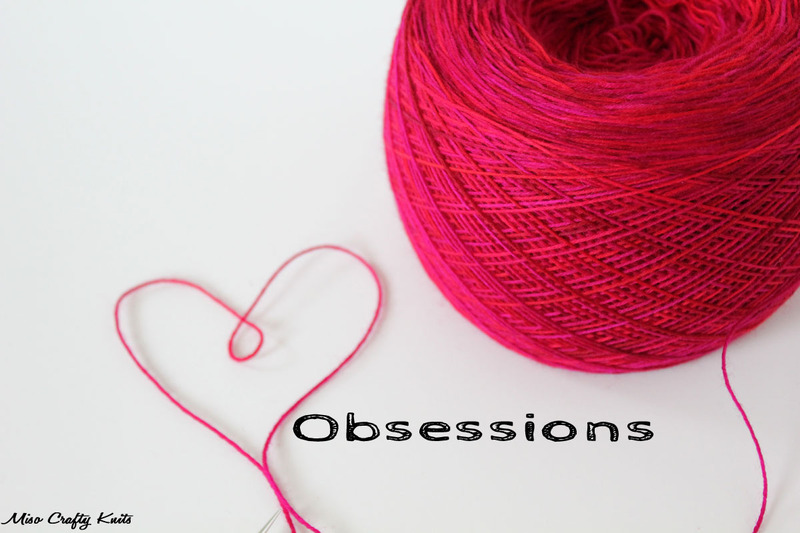 So without further ado, here are a few things that have been dominating my brain all June long...when it's not thinking about bag production, that is. Ok, so this kind of ties in with sewing project bags. BUT aside from thinking, planning, and buying fabric for bags, I've also been scouring the interwebs for garment making fabric. I had decided long ago that I needed to add more dresses to my wardrobe but only recently resolved to actually do something about it. I honestly went from store to store (to store) looking for dresses, but have come up dismally empty handed. Either I didn't care for the fabric or print a dress was in, or the ones that I did like didn't fit properly and would have taken more time than it was worth to try to alter them to make them fit. Le sigh. So the plan: to make the dresses myself. Um, yeah...easier said than done. Mainly because I can't find fabrics that I like and I'm also pretty darn picky. Not really the best mix. The new game plan: to find a bunch of fabrics that I can see myself wearing THEN start sewing the dresses. Before, the previous strategy was to design or plan a dress and then try to make it materialize. But you see, I'm one of those people that when they get an idea, the outcome has to look and be the way I planned it. 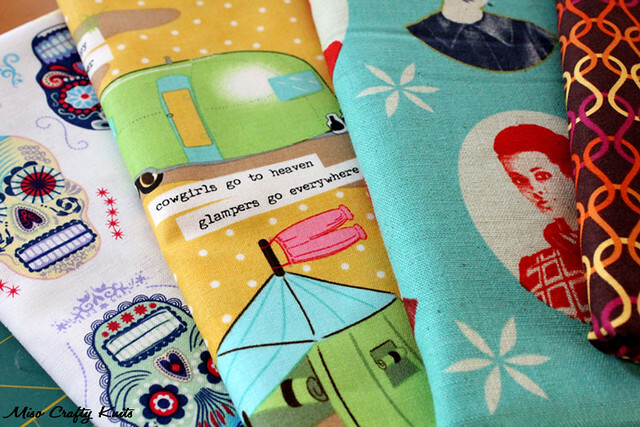 Which is utterly ridiculous because the fabrics that I have in my head just don't exist. And sadly, I don't have the cashola to make the fabric exist. So sad. Yeah, mason jars will ALWAYS be an obsession of mine. But now that it's summer, the obsession for them comes out in full force. Cause dudes, it can get hawt outside! So that means icy cold bevvies are a must! And for some reason, these bevvies taste even better when they're served in a mason jar. Or at least, it does for me. So you bet I'm sipping back the iced coffees, iced teas, smoothies, milkshakes, and even water with fruit slices in them in these glass vessels of atomic awesomeness! 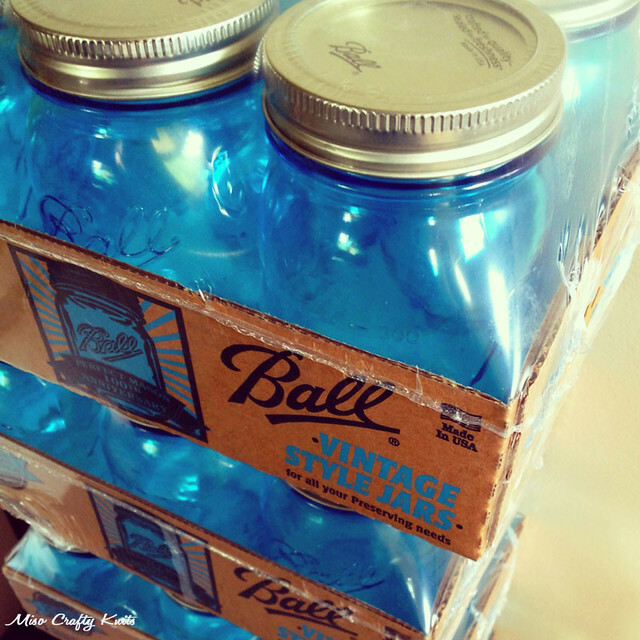 At the beginning of the month I managed to snag a few cases of the gorgeous vintage-style blue Ball mason jars you see above. I'm trying to convince the Mister that we need to replace all of our drinking glasses with these magnificent blue jars. I think I'm slowly wearing him down. YES! Is it wrong that I want to buy several more cases of these blue beauties and horde them? I went to a tea party last week and the fabulous hostess had served chilled water with slices of lemon, cucumbers, and sprigs of mint to all the guests in these gorgeous jars. It made me squee with such glee! Consuming beverages isn't the only thing happening around here when it comes to mason jars. Now that all the yummy fruits are coming into season, so is the need to can and preserve it all. Within the last week I've been making strawberry jam like as if doomsday is just around the corner. It kind of started when my local grocer had pounds of strawberries on sale for a dollar, and now that the first batch of jam has been made I'm itching to turn everything else into jam. I'm just glad that both the Mister and the Munchkin LOVE PB & J sandwiches! Fact: I am a lip balm fiend. You can find several tubes and pots of lip balm in all my handbags, can see piles stacked on my night stand, and can spy handfuls scattered across my dresser. They're peppered amongst the papers on my desk, and they're piling up in the console of the truck. I am never without a tube. Does a person really need that many tubes of lip balm? If you're me, then yes. Yes, you do. I have overly sensitive lips. Left unprotected and to their own devices my lips will crack, blister, and burn in every possible environmental element there is. The sun is definitely no friend to my lips. So you see, lip balm is an absolute must. My absolute favourite lip balm comes in pot form, which could make for a germ-infested application while beach combing and scaling playground walls. My previous favourite lip balm is slowly falling out of favour due to the fact that several tubes have lost their creamy texture and have been replaced with a grainy one, and some of them no longer smell of the flavour they are suppose to be. It's a total bummer. To make matters worse though, I've discovered that they melt pretty easily in my pocket or when left in the truck for a few hours, and on hot days I've found a few had melted in my handbag - sometimes with a little bit of the oils leaking out! Eek! At first this wasn't an issue but now that summer is upon us, I definitely need a lip balm that won't melt at the first sight of the sun. Enter: Hurraw lip balms. I discovered these tubes of fabulousness through an internet friend when I saw her little stash of them on Instagram (who also happens to be a local to me and had highly recommended them). Being that I'm the type of person that loves to sample new products, I knew I had to try them out...especially after seeing that Root Beer was one of the flavours! Lucky for me, I can find Hurraw lip balms in my local health food grocery store and was able to pick up 3 tubes (in the flavours that you see above, the Black Cherry is my fave!!). So do I like them? Well, let's just say that upon the first application I became an immediate convert!! They smell awesome, they glide on like silk, they don't "bleed" past the lip line, they don't leave the lips feeling greasy, they offer a slight tint to the lips, and best of all, they make your lips sooooo soft and smooth!! If that's not enough to sell you on them, Hurraw lip balms are organic and made with absolutely no GMO ingredients. For those who are a little more pickier, they are also vegan and gluten free! But the best thing about Hurraw: they won't melt in your pocket!! Apparently that last tidbit was one of the company's main criterions when it came down to formulating the perfect balm. So.freakin'.awesome. Can I say any more good stuff about this lip balm?? Probably. But I think you'll just need to go get yourself a tube (or two) and find out for yourself! I'll definitely be getting a tube of the Chai Spice and Green Tea myself sometime soon! Ooh, those lip balms look AMAZING! I love it that they have an Earl Grey version, too. Will definitely check them out! I totally did pick up some Earl Grey :) I almost got Grapefruit too, it smelled AMAZING! I had blue masons at my wedding, which were awesome! If you can't convince the hubby to turn them into drinking glasses, here are some other fun ideas! Love the look of the lip balm!